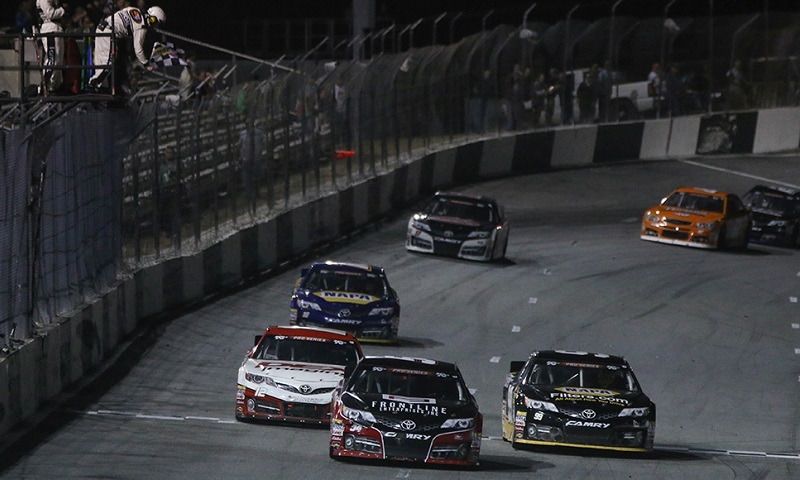 NEW SMYRNA BEACH, Fla. – The NASCAR K&N Pro Series East season ended last year with Harrison Burton and Todd Gilliland fighting tooth-and-nail for the championship. Sunday night, a new year kicked off with the pair scrapping once again, this time for the win in the opening race at New Smyrna Speedway. In an all-out war for supremacy, the duo combined to lead all 175 laps at the half-mile Florida short track, with surprising strategy and eight caution flags leading to a back-and-forth power struggle. Burton led most of the laps from the pole after staying out on track at both of the scheduled competition breaks, stretching one tank of fuel the entire distance while Gilliland pitted at lap 65 and ran him hard in the closing laps. Gilliland used a restart with 45 to go to muscle his way to the top spot from the bottom lane, but it was a yellow flag for the spinning Matt Levin with 15 laps left that truly set the stage for the clash of the young titans. The No. 54 Toyota of Gilliland got the jump when the green flag flew with eight circuits left, but Burton pressed his back bumper hard and laid in wait until two to go, when he forced his way to the inside in turn three and powered off the corner to lead at the white flag. But he ultimately made the move one lap too soon, as Gilliland got back underneath Burton off the exit of turn two on the final lap and returned the favor entering the final turn, pushing Burton wide and sailing on to victory with the last-lap pass for his second win in three years at New Smyrna. Rouse snuck underneath Burton coming out of turn four and stole second at the start-finish line, while Burton crossed in third after his hard-fought battle with Gilliland. Despite being disappointed with the final outcome, Burton held his head high and remained optimistic for the days to come. Reigning K&N West Rookie of the Year Derek Kraus and Gilliland’s rookie teammate Tyler Ankrum completed the top five. Spencer Davis finished sixth ahead of Anthony Sergi, Ronnie Bassett Jr., Tyler Dippel and Brandon McReynolds. The NASCAR K&N Pro Series East season continues on April 14 with the Zombie Auto 150 at Bristol Motor Speedway.